Causeway occupiers set up Facebook pages, hoping people will continue to support their demand for real universal suffrage in Hong Kong, Dec. 15, 2014. Hong Kong police on Monday cleared away the third and last of the pro-democracy encampments on major roads and intersections in the semiautonomous Chinese city, as the city's leader said the 78-day-old civil disobedience movement had come to an end. Police arrested 20 protesters as they cleared the last remaining Occupy Central site outside a Japanese department store in the busy shopping district of Causeway Bay, dismantling barricades, makeshift shelters and clearing away banners and symbols of the "Umbrella Movement." "With the completion of clearance work at the occupation site in Causeway Bay, the illegal occupation that has lasted for more than two months...is over," Chief Executive Chun-ying Leung told reporters. He said the protests had caused "serious" economic losses and "damaged the rule of law" in the former British colony. "If we only talk about democracy, but not about the rule of law, that's not true democracy. It's just anarchy," Leung said. 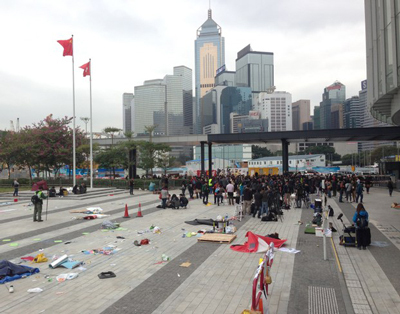 Monday's operation also saw the end of a small camp outside Hong Kong's Legislative Council (LegCo), and brought to 955 the number of people arrested in connection with the movement, which has campaigned since late September for fully democratic elections in 2017. The clearance of the sites went off peacefully, with protesters removing their tents and personal belongings well ahead of police deadlines, although some remained behind to be removed by police in a public show of civil disobedience. A Causeway Bay protester in his nineties who was frequently interviewed during the protests and became widely known as Uncle Wong, said he was unhappy with Leung's response to the protesters' demands. "C.Y. Leung hasn't responded to our demands, even though hundreds of thousands of us have been sitting here for several months," Wong told RFA as the Causeway Bay camp was cleared. "He has totally ignored us, so we still want answers from him." "I want to stay in jail if I can, to force him to pay for my keep." Pan-democratic lawmaker Chan Ka Lok was also at the scene. "They can take action against us today, and clear us away from Causeway Bay, but that's not the end of the dispute over political reforms," he warned. Many of the arrests were for "obstructing a police officer in the course of duty," local sources said, adding that those arrested were put into police cars and taken to nearby North Point police station. But the clearances came amid warnings from one of the original founders of the Occupy Central movement, which brought hundreds of thousands of people onto the streets at its height, after riot police used tear-gas, pepper spray and batons on umbrella-wielding protesters, most of whom were students. Occupy founder Benny Tai told government broadcaster RTHK that the end of the occupation didn't mean an end to the Umbrella Movement or the campaign for full democracy in Hong Kong. Tai said the movement could descend into violent riots if the government continues to ignore popular demands for public nomination of candidates in the election for chief executive and more direct representation in LegCo. According to an Aug. 31 decision by China's parliament, the National People's Congress (NPC), all 5 million of Hong Kong's voters will cast ballots in the 2017 poll, but may only choose between two or three candidates vetted by a Beijing-backed election committee. Meanwhile, the ruling Chinese Communist Party has criticized international support for the Occupy Central protests, saying that the 1984 Sino-British Joint Declaration is "void" and that China answers to no one in exercising sovereignty over Hong Kong, which was handed back by the U.K. in 1997. Beijing has lauded the clearance operation, saying that it "fully agrees and firmly supports" the Hong Kong government and police. Meanwhile, Hong Kong police commissioner Andy Tsang has vowed to pursue the instigators of the Occupy movement. "Our aim is to complete this investigation within three months, including all of the processing of suspects," he said. "In particular, we want to bring to justice those who played a leading role." But Tsang also told reporters that the force will investigate more than 1,900 public complaints against the police during the Occupy movement, many of them linked to allegations of abuse of police powers or authority. He defended the police force's handling of the protests. "Any use of force was only enough to achieve legitimate goals, and officers stopped using that force when those goals had been achieved," Tsang said. "If people had left when they received the verbal warning from police that they should leave, and if they hadn't acted illegally or resisted or charged at police officers, the police wouldn't have needed to use any force at all," he said. Student leaders have vowed to pursue their movement using means other than blocking roads, with student groups polling their members about potential rent and tax boycotts instead of physical occupation. Student leader Lester Shum, a core member of the influential Hong Kong Federation of Students (HKFS), said many of the arrests during protest clearances were "influenced by political factors," and that he had been told he would have to wait until Monday to find out if public order charges against him would be dropped or pursued. "Or perhaps they just wanted to keep us under surveillance," said Shum, who like many others was released on bail shortly after being arrested. HKFS leader Alex Chow told local media that the movement would continue in some form for as long as the government continued to advocate "fake universal suffrage." "The government will undergo a second round of public consultations [on electoral reform proposals] in January, and other proposals may be on the table," Chow said, adding that the final reform package wouldn't be presented to lawmakers until May or June. He described the end of the Occupy movement as "neither victory nor defeat." "I think in the future we will see many more people supporting our movement," he said. An Occupy supporter surnamed Choi, who camped for weeks at the main protest site near government headquarters in Admiralty, said the movement isn't over. "They may have cleared the occupation sites, but they can't clear away our minds," Choi said on Monday. "The seeds have already been planted." "We will continue with this; we won't give up," she said. "We will just find other ways to continue the struggle." Choi said she had joined the movement out of anger at Hong Kong's chief executive, who was elected in 2012 with just 689 votes from a 1,200-strong Beijing-backed committee. "To begin with, I didn't really agree with [Occupy Central]," she said. "But the more I watched things unfold, the more I didn't like what I saw...If we don't stand up now, then there won't be any Hong Kong left at all." Labour party chairman and lawmaker Lee Cheuk-yan said the eventual clearance of the Causeway Bay site was inevitable, once the main Admiralty site had been cleared last week. "This clearance operation doesn't signal the end of the movement, but a new beginning," Lee told RFA. "The movement will continue, if the special administrative region government and the central government refuse to give Hong Kong full democracy." Reported by Lin Jing for RFA's Cantonese Service, and by Xin Lin and Yang Fan for the Mandarin Service. Translated and written in English by Luisetta Mudie.